MY ROLE: Refresh brand identity with contemporary, vibrant visuals. Initiate and manage website redesign. Create digital and print promotional materials. SKILLS/TOOLS: Photoshop, Weebly, Wordpress, copy writing, photography, Sketch, UX, HTML. Max's Diner and Bar serves all-America favorite food in casual environment to the Bay Area for the past 25 years. The goal of rebranding was to adopt to hip environment of downtown Oakland and bring new tech crowd to the diner. During rebranding website maxsoakland.com was created, but unfortunately since the location had to close the doors, the website doesn't exist anymore. I created a new color scheme for the brand, with more vibrant green, and a new accent color - orange. New chalkboard background was implemented to match the existing well known Max's checkerboard details. 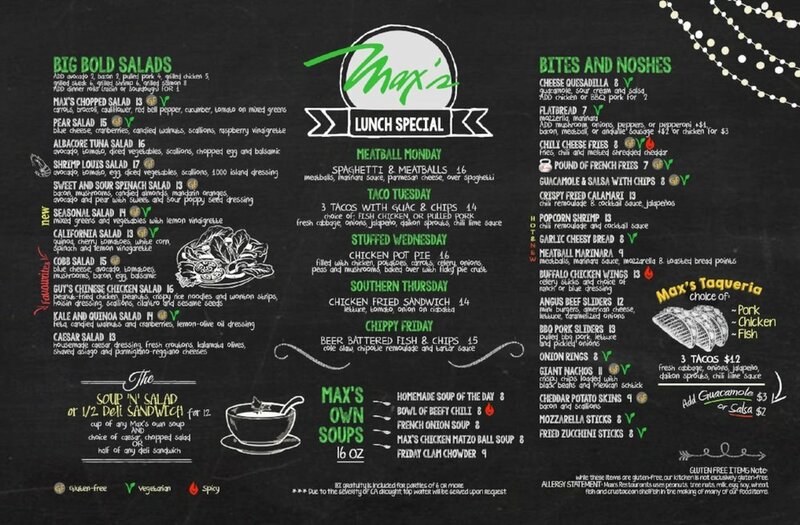 I designed Max's first menu as double sided separate pages: Food and Happy Hour menu. Later on Fit menu was created and it became more complicated to handle the menus to customers. It was the time to have a redesign based on new customer needs. Catering menu had to be a compact menu with lots of mix and match possibilities and add ons. I created a 6 page foldable menu for easy distribution in local offices. Fit menu was a great addition to diner's healthier choices. 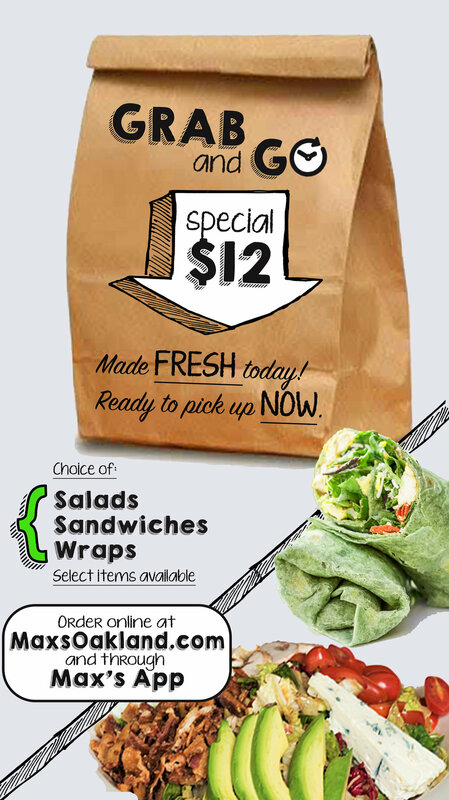 We wanted to give flexibility to customers and make a clear menu easy to read. Max's second menu edition was an extensive 9 page binder, having distinctive categories and different page sizes for a better unified search. Decision was made to use the chalkboard just on the first page for better readability in the darker parts of the restaurant. I created concept and executed on diverse marketing promotions. Promotions where heavy on print, but also included online postings. 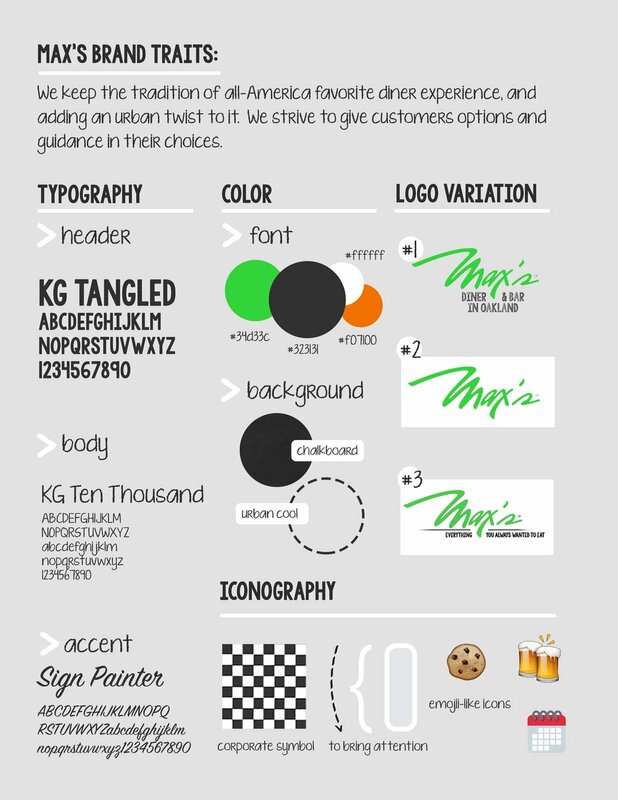 Most print material for Max's are made in Photoshop. Brand consistency is the key in promotion. Using the same event logo is a useful tool.